The Pickering Dragon Boat Club (pdbc) summer program is designed to provide a physically and mentally fulfilling activity for paddling enthusiasts of all ages. Using dragon boat racing as the vehicle, the program has been designed to help improve health and wellness, meet new people and maximize knowledge and performance as a paddler. The pdbc operates out of the Frenchman’s Bay Marina located at the south end of Liverpool Rd, north of Pickering’s Millennium Square and boardwalk. This location is easily accessible by vehicle and is approximately a 2km walk from the Pickering GO station. The club gladly accepts members of all ages (12-60+) and provides an instructional atmosphere designed to optimize personal performance, team success and club spirit. Club - to combine or join together, for a common purpose. With this in mind it is our mandate at the pdbc to bring members of all ages together to create shared experiences. We accomplish this by having all club members participate in practices at the same time. By utilizing our fleet of dragon boats we can accommodate 200+ members during weekly practices. We believe this philosophy of joining together differentiates us from other crew based organizations in the dragon boat community and will result in efficiencies of working towards a common purpose. 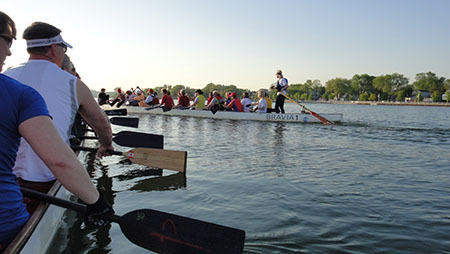 The sport of dragon boat racing is governed by the International Dragon Boat Federation (IDBF) which is represented nationally by Dragon Boat Canada (DBC). All national racing members of the pdbc summer program will become registered members of Dragon Boat Canada and as a result contribute towards the local, national and international development of the sport of dragon boat racing. This guideline is used at the pdbc to arrange athletes into the appropriate crew for practice and racing purposes. Registered athletes will receive practice, competition and social opportunities within the club. We gladly accept members of all ages and athletic intentions. This event is designed to allow club athletes, coaches, administrators and friends to reminisce about the trials and tribulations of the season. This event also allows award recognition for outstanding achievements within the club throughout the year. All pdbc athletes must wear an official club jersey during all competitions. Jerseys will be crested with official club logos.